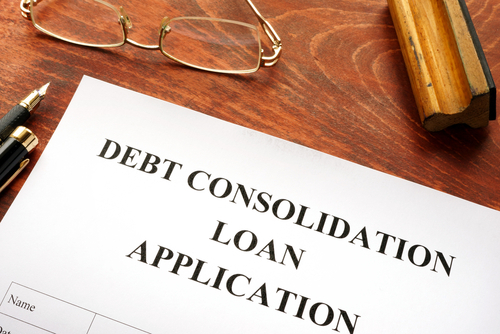 A debt consolidation loan can help you roll several monthly payments into one. A good debt consolidation loan may offer a lower interest rate or more manageable payment terms. Securing a debt consolidation loan with a poor credit score requires extra consideration. If you owe a significant amount of debt, it’s important to get a grip on the situation. Letting debt go unpaid can damage your credit score and ultimately create larger bills that you’re responsible for settling in the future. Unfortunately, the same debt that you’re struggling to pay off may already be hurting your credit score. Getting a debt consolidation loan with bad credit is more difficult than getting a loan with a high credit score. It’s important to understand the process so you can find the best solution. Debt consolidation is the process of rolling several loans or credit cards into one. This can help you eliminate the struggle of making multiple payments every month by simplifying your repayment plan. The right debt consolidation plan will also make it easier and more affordable for you to pay down your credit card debt by reducing interest charges. If you’re struggling to keep up with your credit card and loan payments, debt consolidation is an option that you should consider. Debt consolidation is most beneficial when it allows you to secure a lower interest rate or lower monthly payments. If you’re not having trouble keeping up with your debts, you may want to keep these expenses separate. It’s better for your credit score overall if you have diversity in your profile. Consolidating your debt will eliminate that. However, it’s very detrimental to your credit score if you’re not able to keep up with your monthly payments. It’s better to consolidate than to miss payments and go into default. Debt consolidation loans are used to pay off several smaller loans. A good debt consolidation loan will offer better terms than what you’re currently dealing with. It’s important to think about your primary goals when you’re choosing a debt consolidation loan. If you’re unable to make your monthly payments, a debt consolidation loan may offer you lower payments that you can meet more easily. However, it’s important to know that this may come at the expense of a higher interest rate and a longer repayment schedule. If you’re able to keep up with your monthly payments, you should focus on your interest rate above other factors. Seek a debt consolidation loan that will lower the total sum you’re paying for your debt. Paying off as much as you can afford each month will help you get rid of your debt as quickly as possible. Choosing a consolidation loan with a low interest rate will cut back on the total that you have to pay for your accumulated loans and credit card debt. An example of how this works would be an individual who has three credit cards with significant debts on them. $1,000 at 20 percent interest, paying $20 a month. $2,000 at 22 percent interest, paying $40 a month. $2,000 at 19 percent interest, paying $40 a month. This comes to a total of $10,860 for just $5,000 of credit card charges, thanks to the effects of high interest rates. A debt consolidation loan could help in one of two ways. If you’re unable to pay even $100 a month toward your credit cards, you might choose a debt consolidation loan with a longer repayment period. At an interest rate of 20 percent, by extending your repayment term to 180 months, you could lower your payments closer to $85 a month. If you’re focused on paying less for your loans over the long term, look for a debt consolidation loan with a lower interest rate and shorter term. If you could secure an interest rate of 17 percent and pay $125 a month, you could settle your debt over 60 months for a total of $7,500. This gets you debt-free faster and saves you more than $3,000 over simply paying the minimums on your credit cards. If you’re shopping for a debt consolidation loan with bad credit, there are some critical considerations that you’ll have to think about. When a lender is considering you for a loan, one of the most important factors is your credit score. If you have bad credit, you’ll usually face higher interest rates. This puts individuals in a tricky situation if they can’t pay the minimums on their credit cards to effectively improve their credit scores. Consistently paying down your debt is a good way to increase your credit score. If you’re not doing this, it may help to get a debt consolidation loan that enables you to do so, even if you have to deal with a higher interest rate. Missing payments will leave you with monthly penalties that are usually more costly for you, both in monetary terms and in terms of your creditworthiness. There are many places that you can get a debt consolidation loan. Shopping around is key to finding the best option for your needs. One of the first places to look is your bank or credit union. These establishments may already have a relationship with you, which can help when you’re fighting the effects of a bad credit score. If you’ve been responsible in other financial areas, your bank will have a picture of this via your account activity. This could give you the edge you need to secure a debt consolidation loan. One thing that you should try to avoid in this process is a payday loan. These are tempting because they’re more accepting of individuals with bad credit. However, payday loans aren’t really intended for debt consolidation. These are meant as a last resort if you don’t have enough funds to pay for your living expenses until the next payday. Payday loans come with very high interest rates. Because they’re easier to obtain, they can create a tendency to return to the payday lender any time you need extra cash. What you’re paying in interest for these negates most benefits. When you’re comparing debt consolidation loans, there are several things that you should look for. Take the time to find the loan that’s best-suited to your needs, and look at these essential factors as you’re considering your options. There are many fees that can come into play when you’re signing up for a debt consolidation loan. You need to include these in all your calculations to make sure you’re still coming out ahead in terms of the total sum that you’re paying for the loan. A plan that seems favorable at first may become too costly once you realize the fees or penalties involved. Application Fee: If the lender charges a fee to apply for the loan, you’ll need to be especially careful about starting this process. Make sure you’ve settled on the loan that you want. Processing Fee: This may apply at the front end of the loan. A processing fee is intended to pay for the costs of processing the loan, completing credit checks, and taking care of other administrative tasks. Initiation Fee: The initiation fee is the cost of setting up the loan originally. Prepayment Penalty: A penalty may apply if you pay off the loan early. If you’re pursuing aggressive repayment of your debt, this will actually make it more costly to get rid of your debt faster. The interest rate determines how much you will ultimately pay for the loan. Look for the lowest interest rate you can find. This can make a dramatic difference in your long-term savings, keeping thousands of dollars in your pocket over the course of the loan. It’s important to choose a loan that you can afford to pay back in a timely manner, meeting the terms set forth in the agreement. If you’re struggling to meet your monthly minimums, make sure that your loan has a monthly payment you can comfortably afford. Defaulting on your consolidation loan won’t help you improve your credit – and could make your situation worse. You should also consider the length of the loan. The longer you’re paying off the loan, the lower your monthly payments till typically be. However, you want to pay off your debt as quickly as you can afford to, to free yourself from this financial burden and pay less, overall, in interest charges. Lower your credit utilization by paying down your card balances. Contact creditors when you cannot make your payments to avoid negative notations on your report. Keep unused cards open rather than closing them. Do not open new cards or seek other new loans before applying for your consolidation loan. If you can’t improve your credit score sufficiently, you might also be able to secure a better debt consolidation loan by applying with a co-signer. A parent, spouse, or another family member with good credit who is willing to sign on the loan with you may help you access better interest rates for your consolidation loan. A debt consolidation loan isn’t your only option if you’re looking for a more efficient way to manage your outstanding loans and credit card debt. Consider some of these choices. You don’t need to have excellent credit to secure a home equity loan because your home is standing in place of your creditworthiness. The risk to the bank is lower because they gain the right to claim your home if you fail to pay off the loan. This does, however, increase the risk for you. Pursue this option only if you’re confident you can keep up with the loan payments. Also, understand that under the new tax laws, the interest on your home equity loan will not be tax deductible if you use the money to pay off debt. Filing for bankruptcy is a last resort, but one that you may need to think about if you’re in a disastrous financial situation. Bankruptcy will eliminate certain types of debt, but it ruins your credit score, so you won’t be able to get a new loan or credit card for many years. A debt relief company can help you come up with a smart way to tackle difficult debt. These companies will contact your creditors and attempt to negotiate settlements that will let you pay off your debt for less than the total sum. You will need a lump sum to pay off these settlements, but overall, the debt settlement company can help you lower the total amount that you pay. Debt settlements may also come with tax ramifications that you should be aware of. The IRS considers the forgiven debt as taxable income, so consult with a tax accountant before you accept any settlement agreements. If you’re looking for a way to tackle your debt despite a poor credit score, there are several options that are available to you. A debt consolidation loan is just one possible choice. Call us today to find out how Solvable can help you compare your options for debt consolidation and settlement companies, and get personalized payment plans to help you pay down your debt faster than you imagined. Next PostNext Can I Consolidate My Tax Debt Owed to the IRS?